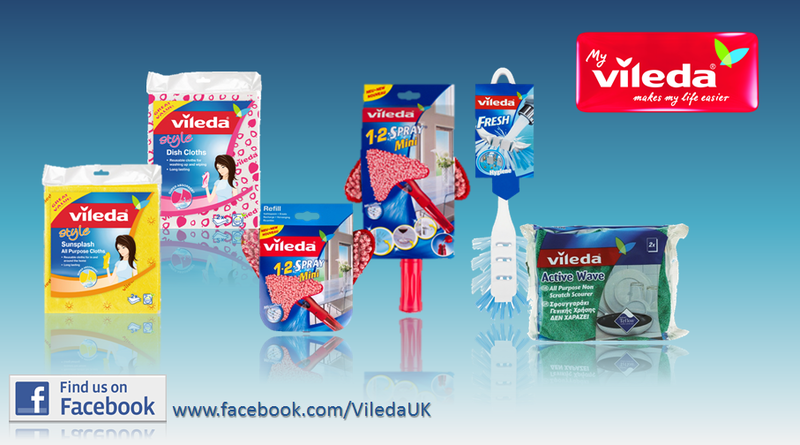 How do you fancy winning some Vileda cleaning products? With the children going back to school, now is the perfect time to do a big push on the housework front. That can only be easier if you win cleaning products. I have tried to keep up with the housework over the school holidays. I have even tried to get the children involved but they prove very reluctant. It can be difficult to juggle everything that needs to be done over the school holidays. As soon as the new term starts, I am going to do a major cleaning and tidying blitz. To celebrate the launch of their campaign, ‘Floor Miles’, I’ve teamed up with Vileda, the UK’s leading household cleaning brand. Vileda is offering one lucky reader the chance to win £25 worth of cleaning goodies to get their homes ship shape this summer. Perfect for busy homes, Vileda products are designed to last miles longer and make your cleaning miles easier! You can enter via to win the cleaning products pictured via the Rafflecopter below. For more competitions and to find out how to collect Vileda ‘Floor Miles’ and be in with a chance of winning a family eco-holiday, head to the Vileda UK Facebook page. I don’t like doing it but I do love the feeling of sitting down when its all done and looks great! i dont mind cleaning, and my 1&2 year olds love following me around with a cloth or towel helping, they also love the dust pan and brush and other simple cleaning tasks! absolutely hate housework – a necessary evil! I loathe it but for some reason my husband likes it. He spends ages in the cleaning aisle at Tesco! Definitely on the loathe side. I really hate housework so anything to make it easier is welcome. I love anything that makes cleaning easier! Can’t say I love housework, but it feels good when everything is neat and tidy. I loathe it, with a passion! I don’t mind it….it’s nice to see clean house. The only problem is it’s destroyed by kids five minutes later! Loathe it as it seems to be a never ending task. I could follow my kids around cleaning up after them and the job would never be done! I love polishing and cleaning the floors. It gives me great satisfaction when everything sparkles. The rest of the chores I loathe. I find cleaning a necessary evil but have a great satisfaction once done. I love doing housework when the house is clean and shiny not that it lasts long with a active 2 year old luckily my son loves cleaning too so the biggest arguments in our house is who is going to dust and vacuum. Depends what mood I’m in and what it is. Though I never enjoy cleaning the oven or the toilet. Hate it, only do it when I have too. I loathe it but it has to be done! Hate it – but as others have said, love sitting down when it’s all done. That’s my weekend treat when my son goes to his dad’s – that way it stays nice for a couple of days until chaos descends again. I loathe house work, there are so many other things I prefer to do with my time. A bit of both really! I do love the end result of a sparkling clean house. Loathe it! I wish a magic fairy would come and clean up for me! I do not loathe it but would be happy for someone to do it for me. I do love to see a nice clean home though. I don’t like cleaning but I do like viewing my work after its done, with a sense of pride!! Housework is a necessary evil, I hate doing it most of the time but it has to be done. I do it to 60`s music and sing along to take my mind off it. After fifty years of marriage and housework I can’t say that I enjoy it anymore but neither do I hate it. It is just a necessity these days. I hate cleaning the shower screens! Not really a big fan of house cleaning – do best to keep things picked up, but with more than one person plus pets in the household – doesn’t always work. Depends on which housework it is. I love anything ‘standing still’ as I find it theraputic i.e. washing up, ironing, haging washing, washing windows but loate anything that involved ‘bending’ as it hurts my back i.e. changing bedsheets, washing the laminates, picking up kids toys. Not that keen on house cleaning, but the house does look far better and I myself feel better for doing it. I like the finished result- house sparkling clean and tidy. It’s good exercise which is what I tell myself when I feel like the chores will never end! dont mind it, if i am in the right frame of mind at the time, but it is so worth it afterwards! Love it on days off work, hate it when working ! Hate it, it’s never ending! I hate housework cant do much at moment as have buildrs in!! loathe! it takes up so much time! Depends what music is on, usually loathe! Loathe, as it seems never ending. I would much rather have a day out etc, etc. I don’t mind too much but its always nice when someone helps. I loathe cleaning the shower ! I can’t say I like it but I can’t sit down until it’s done. I hate housework, you clean up then it just all gets messed up and dirty again, it never ends. Loathe it. I’ve had a cleaner in the past and would love to again. I quite enjoy housework or rather I like the satisfaction of everything looking clean and tidy! Love it. I even clean other peoples houses! I loathe it! But I love having a clean house! great for taking any frustrations out! ironing, i cant do. i really need some lessons! Loathe! So many better things I could be doing! Not a fan! I have to be in the mood but it never seems to end. oops sorry – damn laptop – commented twice – sorry!! Love cleaning – especially the kitchen ! I love house work, just need the time to do it! Loathe – as soon as I’ve finished it needs doing again! I love housework, find it therapeutic. Hate it, what a waste of time! Loathe it! It never ends. Hate doing it but great satisfaction when it’s done! I loathe it, It takes so long and I never seem to get on top of it. I don’t love it but I love the satisfaction afterwards that for at least a few hours everything is perfect! … doesn’t last long though! Love it -Mainly because my wife does most of it!! Love AND loathe… there are some jobs I love doing and some jobs I really hate! dont mind doing it 🙂 love it when its all done and house is gleaming…. Housework? I’m not sure that I understand the concept? I actually like it but get really quite frustrated when it seems no one but me can see what’s dirty or needs put away! If I’ve got time to do it without interruptions I quite like housework, especially seeing it all done, but hate the idea of it. I absolutely love cleaning. I love a tidy and clean house with a fresh smell. Cannot beat it. Loathe it – it just never ends. Occasionally I’m in the mood for it but most of the time unfortunately I’m not! I don’t love doing house work, but I do love the finished result. Love certain parts and loathe the rest! I like it when there is not a lot to do, but loath it when there is a lot to do. It depends on the task! I like washing up, I hate cleaning the bathroom! I love it,especially with Duran Duran playing loudly in the background.Makes me feel like a teenager again. Loathe it, but it feels better when it is done! I quite enjoy it. Like the sense of satisfaction once the job is done! I really hate cleaning – I clean and tidy and it is a mess within a few seconds! I understand the concept of housework … just not as it applies to me! sounds great anything that makes housework easier is great to me I can’t stand doing house work! I loathe it, I’m a procrastinator! I used to loathe housework, but now I find myself loving it! Loathe it, but always feel better when it’s done. I don’t mind it, but I would not say I love it. The one job I loathe is cleaning the oven! I hate doing it ! Don’t like it but feel better when I have done it. I love it when i dont have the kids making more work for me! I actually love it, a tidy house is a tidy mind! It depends, after working all day I loathe it but I do like a good housework day every now and again! It depends what I am cleaning! Some of it can be therapeutic and some just plain boring!! I loathe housework and love the Quentin Crisp comment that the dust doesn’t get any deeper after four years! Sometimes love and sometimes loathe! A little often…there is no need to hate cleaning! I loathe it but I like it once it has been done! Loathe it: I find it really hard to motivate myself to do any! I really loathe housework! Life’s too short! I love the feeling after a room is clean & it looks & smells fab! It depends what mood I am in! I only love cleaning if its with good products! I hate cleaning… my cleaner is worth every pound! Hate housework, I would much rather be outdoors working in the Garden. Bit of both, hate when I am doing it but feel good afterwards. Hate tidying a lot more than cleaning though so the fella does that. Love to loathe it I guess!! loathe it! need to find a way to make it more enjoyable. I loathe it but I can’t stand sitting in mess. I love seeing my house clean. I think I need to hire a cleaner lol. Loathe general housework but love ironing. I love but loathe cleaning! Love it when the house is clean and smelling fresh, just hate the fact there’s always so much to do and only me that does it! Loathe when it has to be done and doing it. Love when it is done and looking at it. Loathe it but seem to be constantly doing it, with 2 children one of which only 9 weeks old but creates more washing than anyone else! Love it. Apart from the ironing! I love housework when I have the time to do it, love my house smelling clean and fresh and everything tidied away. I love my house to be sparkling clean but I loathe doing it myself! absolutely loathe it lol need a magic fairy to come and help me!! Depends if I’m doing the housework during the week )love it if it is the weekend loathe it! loathe it, but it’s a necessary evil so these products would be handy! I loathe doing it but love the results! A bit of both! I find it tedious which I hate but I love the satisfaction of a clean house! I love housework! Cleaning can be very therapeutic ! Loathe but it’s got to be done! Love it when the children are not around to mess it all up. I quite enjoy it, it beats going to the gym! I loathe it but I like the end result. Loathe is because my kids never let me get on and do anything and when I do finally get things tidy its a mess again within 5 minutes. Sad to say… I LOVE IT… but only when I’m in the mood, and then I can get a bit OCD ! Love it in small bursts – I try and do a little bit every 15 minutes so I don’t sit down at the computer for too long! I love washing up and vacuuming but hate ironing. loathe it…. however i hate the house being a mess, and love it when it is tidy, just loathe the process needed to get it done! I’m a home bird, so love keeping it clean and cosy. I dislike it a lot unless something is quite dirty, then it can be quite satisfying. Not a big fan of housework. I find it boring but have to do it! I never iron but I do like dusting with a paint brush, I get a bit carried away. I loathe housework but it has to be done! I don’t mind as long as there’s music. I like housework.. but I have to be in the mood. I love it esp when its finished but I loathe that after a day or two I can no longer tell it was done! It’s a love/hate relationship with me – hate spending so much time doing it but can’t relax until I have done it. I like it when I have the time but since having my 2 little ones it’s a bit of a challenge! I loathe it but it has to be done. Loathe the thought of it, but once I’m doing it I enjoy it, and I love it when its done and the house is sparkly and smells wonderful. LOATHE 99% of the time. I love the satisfaction of a clean house, I hate the realisation my house is not clean! Hate it. The only thing I don’t mind is doing the laundry.